Earth Colours provides an historical record of ochre mining and the use of ochre on Mendip from the Roman times until the mid 20th century. Neville concentrated on the technical and historical aspects of the industry and Marie looked at what the impact of ochre mining was on the towns, villages and people – her anecdotes of characters and life of the times give a human aspect to this book and some unexpected insights – not least of which being lies, theft and murder! 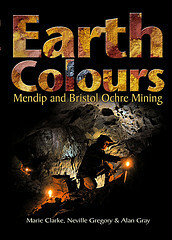 Tony Jarratt has reviewed this book and stated that it will put an entirely different emphasis on mining on Mendip whereas it was thought that the majority of mining was for lead the balance will now be restored with half the mining being for lead and the other half being for ochre. Alan Gray sourced the photographs and redrew all the maps and diagrams and wrote part of Chapter 12 which brings the research from the 1980's to 2011. This book was researched during the 1970’s and was not published. Unfortunately Marie passed away and during 2007 I was contacted by Josyanne Clarke (Marie’s daughter) who wished to publish the book as a tribute to her mother.